Brisbane & Gold Coast christening cakes, baby shower cakes in Brisbane south side, north side and Gold Coast. Custom designed Baby Shower or Christening cakes can be ordered for delivery to Brisbane north side, Brisbane south side or the Gold Coast. Fun christening cake featuring hand-made dimensional owl, giraffe, monkey, rainbow, clouds and name on blocks (all are edible, made from sugar paste). 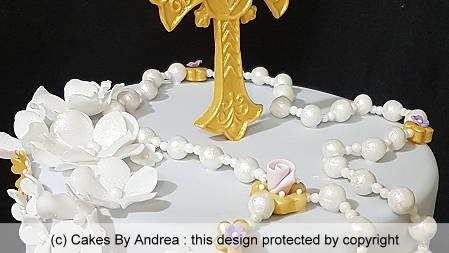 Unique baptism cake with lilac fondant, gold cross on top, assorted blossoms, name plaque, and custom made rosary beads entirely handcrafted from sugar paste. Elegant white cake featuring teal toned blossoms cascading down all tiers and hand-made sugar paste monogram with diamantes. Christening cake featuring assorted snowflakes and handmade sugar paste lace on pink fondant wrap, with butterflies, blossoms and diamante trim set on fondant covered board. Christening cake featuring silver cross with custom made name blocks, inscription and blossoms, set on disc on frosted cake. 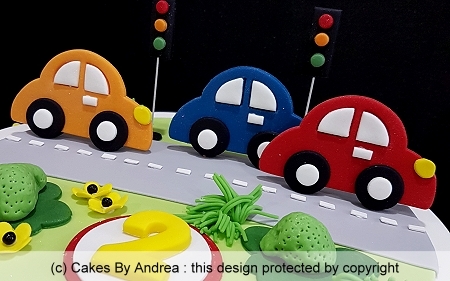 Children’s cake featuring custom handmade edible cars, road strip, traffic lights, bushes, and flowers. Inscription option available. Elegant baby boy cake featuring hand made books, booties, teddy, bottle, and buttons. White and blue stripes with gold inscription on the white fondant covered board creates a luxurious look. All decorations are custom made by Andrea from sugar paste. To order your cake please contact me.